International unmarried childbearing trends featured in new report! Births to unmarried women in the United States totaled 1,714,643 in 2007, 26% more than in 2002. Nearly 4 in 10 U.S. births were to unmarried women in 2007. The United States is not unique nor does it outpace other countries in nonmarital childbearing. For example, well over one half of recent births to Icelandic, Swedish, and Norwegian women were nonmarital. Proportions of nonmarital births were also high for births to French and Danish women. The proportions in the United States, nonetheless, are considerably higher than in some industrialized countries. 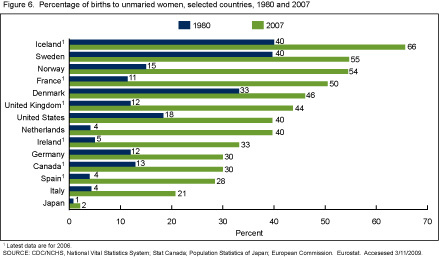 For example, less than 30% of births were to unmarried women in Spain, Canada, Italy, and Japan. Click on the chart below or visit the complete report at www.cdc.gov/nchs. This entry was posted on Wednesday, May 13th, 2009 at 1:08 pm and is filed under 1. You can follow any responses to this entry through the RSS 2.0 feed. You can leave a response, or trackback from your own site.